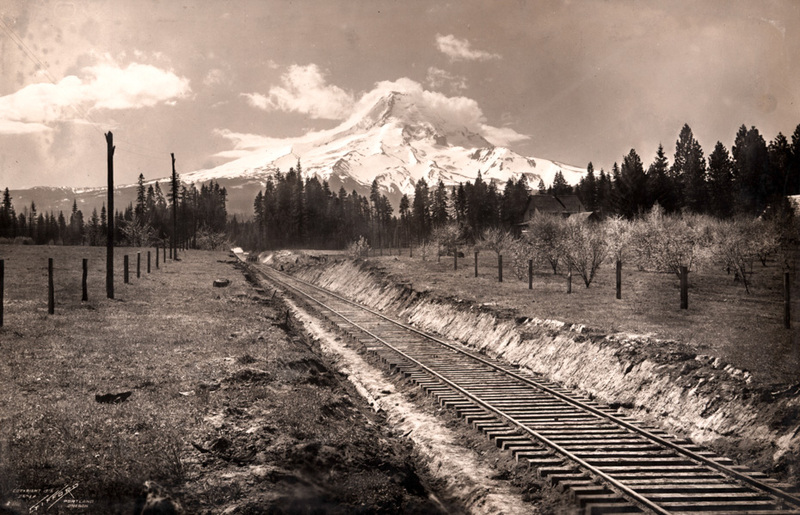 About 1910 the Hood River Commercial Club (predecessor of the Chamber of Commerce) hired Benjamin Gifford to prepare photographs promoting the Hood River valley. We have three albums of 8x10 prints at the museum which apparently resulted from that effort. Most of them show branches heavily laden with various kinds of apples, but they are all technically excellent and quite a few are of more general interest. I think a few of these might be a nice distraction from the snow this week. What a nice view of Mt. Hood, a newly planted orchard, and the newly laid Mt. Hood Railroad track. I can certainly imagine how a farmer in the mid-west could be lured halfway across the continent by this sort of marketing. In one image a would-be orchardist sees productive land, easy access to markets, and a land of unsurpassed beauty. Even better, there's not much exaggeration in it. Many of these orchards are still around, tended by descendants of those lured by this marketing campaign. "This is why they came in abundance from the east to buy land." I hope the locals can tell us where this was taken. Can anyone tell what that is on the track in the distance? Almost looks like the end of a spur line with a couple of buildings further away. Good eye Marilyn. Looking at the original scan I see a cluster of about a dozen people standing very closely together on the track, and what looks like two buildings beyond. Unfortunately this scan wasn't done at the highest resolution for technical reasons, so I don't have as much room to zoom as usual. Could well be a track crew as the track appears to be still under construction. Notice that there is just a wee bit of ballast between the ties at this point. Could also just be a group of people walking along the tracks. Likely easier and more pleasant to walk on the ties than to deal with the ruts and mud holes of the roads. Any idea where this straight stretch in a small cut is located? My guess is near Parkdale. New track is indicated by little or no ballast, still the pole line and fences are in. Accompanying a May 10, 1911 HR News front page article concerning a Sunday Oregonian story about the development of the Upper Valley was this very photograph.